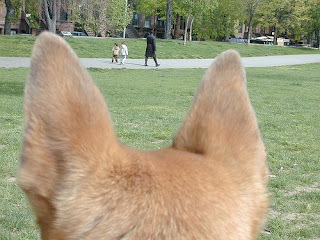 There was some question recently about a loss of hearing in my beloved pooch. Not a bad guess at all given her age. Big ears like that, they should last longer than average, shouldn't they? The other night as I was gathering my things for bed Emily climbed up her ramp (yes, she has a ramp so she can get into the bed, I know she's spoiled, this is not news) and settled herself on the bed. She was arranged quite prettily, curled into a comma with her head upright and face precisely away from me. Oh yeah, and she was doing all that just below my pillow, right in the one tiny spot where I am (usually) allowed by my animals to sleep. Most times I'd get into the bed and shove her over with my body but I decided to use the opportunity to test the deafness theory. She was facing fully away from me and not paying attention, it was the perfect opportunity. I snapped my fingers once. This is our universal signal for sit down/shut up/get down/get up/stop doing whatever whackadoo thing you are doing that is making my brain ooze from pores. Not only did she hear me she didn't wait for a follow up command she just got up and moved out of my space. So not deaf just spoiled and perhaps a really heavy sleeper. Look at those ears! I love them. Is it just me or do you love to smell her ears? Okay, it's just me then. I'm not a smeller of the ears, no. But it's not just you! I know a lot of ear smellers and paw smellers. I am vain about her ears, though, and for most of her life have lived in fear that she'd get one of those hematomas and have to have one of those bad boys quilted. I'm going with spoiled. As she should be!